Buttler was batting beautifully before getting dismissed in the most controversial way. The ball has been set rolling for the 12th edition of the Indian Premier League (IPL). With the game between Rajasthan Royals (RR) and Kings XI Punjab (KXIP) getting underway, all the teams have started their journey in the tournament. But very few must have thought of a controversy hitting so early in the T20 league courtesy Ravi Ashwin, the skipper of KXIP, who mankaded Jos Buttler at the Sawai Mansingh Stadium. The incident happened in the 13th over of the chase when Buttler was in amazing form and was threatening to take the game away from the Kings XI. Ashwin was in his stride to deliver the final ball of his over to Sanju Samson and he suddenly stopped. Ashwin stopped and disturbed the bails at the non-striker’s end just when Buttler was out of the crease. He was backing up too far and Ashwin was quick in appealing as the case went upstairs to the third umpire. Replays showed that the batsman was out of his crease and Buttler was adjudged out on 69 in the most controversial way after batting so beautifully. There was an animated discussion between Ravi Ashwin and Jos Buttler when the former appealed after mankading. It seemed that Ashwin had warned him before but the discussion turned into an argument soon. 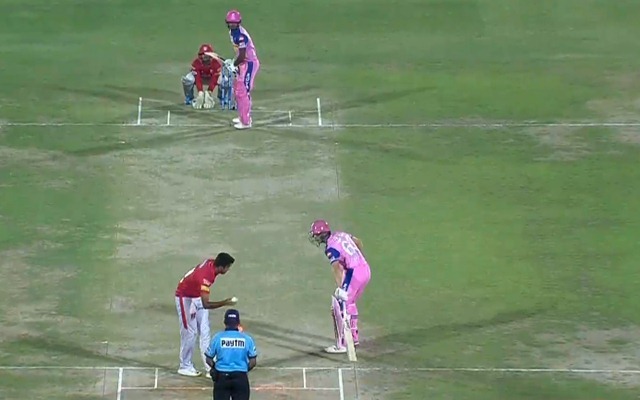 The KXIP captain didn’t withdraw his appeal and Buttler had to walk off with despair. The match was in an interesting situation at that stage and Buttler’s wicket literally had turned the game in the visitors’ favour. Buttler clearly expressed his disappointment while going towards the dressing room. He was batting extremely well and the dismissal was against the spirit but within the laws of the game. The game is still interestingly poised with Steve Smith and Samson batting well and it remains to be seen who takes the final honors in the heated action.